The investigation into Trump and Russia isn’t the only subject Congress must press him on. On July 12, the Senate Judiciary Committee will hold a confirmation hearing for Christopher Wray, Trump’s nominee to be director of the FBI. The hearing is likely to be dominated by questions about the fate of Wray’s predecessor, James Comey, and whether Wray will make sure investigations concerning the Trump campaign’s alleged ties to Russia remain untrammeled by executive meddling. While the circumstances under which Comey was dismissed raise important questions about how his successor would handle investigating the man who appointed him, the hearings are also an opportunity to defend the First Amendment. The FBI has a troubled understanding of the First Amendment. While conventional narratives reduce FBI spying on political speech to a fact of the Hoover era or as part of an overzealous response to the 9/11 attacks, the truth is that the FBI has continuously devoted significant resources to monitoring purely political speech. In roughly the last year alone, FBI agents or FBI Joint Terrorism Task Force agents have made house visits to Black Lives Matter, Occupy Cleveland, and Standing Rock activists. Before the election, FBI agents conducted a serious of home visits to Muslim Americans that smacked of voter intimidation. The FBI has no statutory charter outlining the scope of its authority and power. While such a charter was considered after the Church Committee uncovered systematic political persecution by the FBI, Congress ultimately passed on the opportunity, instead allowing the attorney general to self-regulate the FBI. An amendment to the Violent Crime Prevention Act of 1994 prohibited the FBI from investigating purely First Amendment activity, but Congress swiftly repealed it. As a result, oversight hearings remain one of the only legislative checks on the FBI. This oversight has been lax in recent years. Comey faced little pushback as to why the FBI conducted counterterrorism investigations into political organizations its undercover operatives conceded were nonviolent and peaceful, such as School of the Americas Watch and Occupy Wall Street. The official reason is that, while these organizations were peaceful, unknown actors with their own agendas could at some point in the future hijack these movements. Yet that is true of any group, be it one dedicated to promoting a more just and peaceful US foreign policy or a chess club. The question then arises: Why does the FBI continuously single out groups working for peace, economic, and racial justice, unless it views such political views as being a proxy for suspicion? 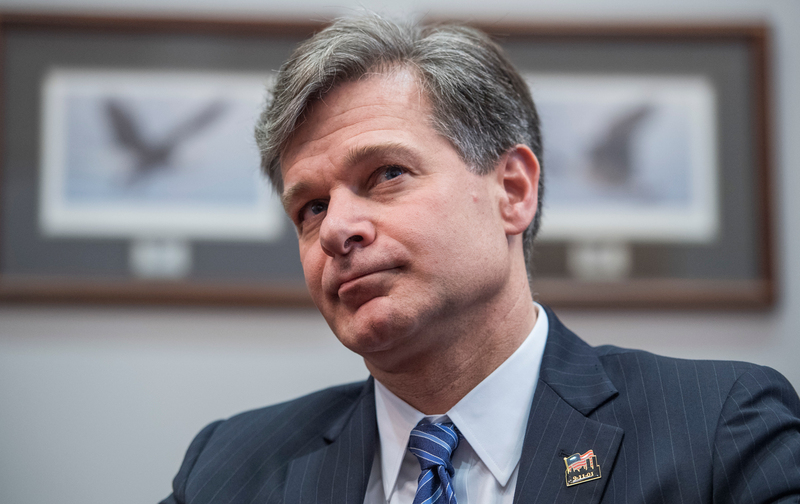 Wray, of course, cannot be reasonably expected to give an accounting of the FBI’s past conduct, but Congress can probe him about what steps he would take to make sure the FBI ceases treating political dissent as indicative of criminality. Given Trump’s own pronouncements, these types of questions are of the utmost importance. Trump has suggested jailing journalists who publish classified information. On the campaign trial, he made a number of pronouncements about surveiling mosques, something the FBI is already engaged in. Wray should be asked if he agrees with such actions. If he purports to find these suggestions to be antithetical to the values of the First Amendment, he must be directly asked what he would do should Trump or anyone else ask him to carry out such policies. Just as we should expect that Wray would assert his independence should Trump try to squash investigations into him or his associates, we must demand that Wray also affirm he would refuse to violate the constitutional rights of the people. Wray’s past within George W Bush’s Department of Justice raises troubling questions about whether he would actually care about the chilling effect law enforcement’s conflation of activism with terrorism has on free speech. Much has been written about Wray’s involvement with post-9/11 roundups of predominantly Muslim immigrants. His name also appears on a number of redacted documents about the United States’ use of torture. During this time period, Wray testified before Congress as an enthusiastic supporter of the USA Patriot Act. During his testimony he lambasted civil-liberties groups for spreading what he dubbed misinformation about the Patriot Act, including claims that allowing the government to access people’s library records might be abused. In the same testimony, Wray cited as an example of the Patriot Act’s success the indictment of Sami Al-Arian. Al-Arian’s initial indictment under the Patriot Act led to protracted legal wrangling that continued well into the Obama era and was little more than a political persecution meant to punish an outspoken member of the Muslim community. In spite of an attempted rehabilitation of Bush, in order to portray Trump’s own Islamophobia and authoritarianism as sui generis, Bush’s war on terror included a domestic assault on Muslim civil society. A number of people within Trump’s orbit support such a policy, meaning that properly vetting the next director of the FBI must include getting him on the record about how he feels about using the FBI as a vehicle to destroy Muslim civil society. Any successful social movement is going to be met with state repression. The last several years has witnessed the emergence of a number of new dynamic social movements, including Black Lives Matter, the Standing Rock Water Protectors, and the more general anti-Trump resistance. Already though, these movements are facing backlash. A series of state bills have emerged that seek to impose stiff penalties on protesters. These bills are rooted in false narratives that conflate protest with criminality or assert that protests are the work of paid agitators seeking to incite violence, narratives that Trump himself has embraced. Given Trump’s antipathy for criticism derived from his own personal megalomania and the FBI’s history of harassing movements, an even-further-unleashed FBI poses a very real threat for the resistance. It is therefore urgent that defending the First Amendment from the FBI plays a role in Wray’s confirmation hearings. Chip GibbonsChip Gibbons is a journalist, as well as, policy and legislative counsel for Defending Rights & Dissent (views are his own). He has appeared as an expert on US constitutional law on Al Jazeera and is a contributor to The Henry Kissinger Files, forthcoming Verso. Follow him on twitter @ChipGibbons89.